Time to say your prayers! While prepping a new adventure for Gods & Monsters, I’ve been watching a lot of movies and reading a lot of books involving haunted, shifty houses. One of the things that makes horror houses appealing to me as an adventure guide is that they are mini (or not so mini, in the case of Rose Red) dungeons. Often, little ideas—creatures, traps, hauntings—can be pulled straight into a dungeon room. The descendants of Shirley Jackson’s The Haunting of Hill House are the most RPG-friendly. A group of people, each with special skills, are brought together to investigate unknown phenomena; they do so by walking into an ancient structure and searching the rooms! The inspiration for House on Crane Hill is this multi-issue story from the seventies comic book Werewolf by Night. Marcosa House scared the crap out of me as a pre-teen. 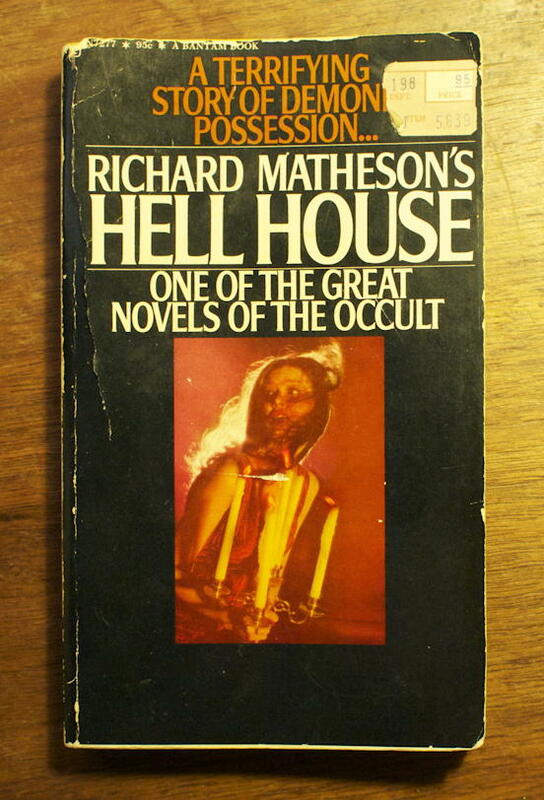 It is clearly influenced by The Legend of Hell House, right down to the name of the ghost. This is from when the Werewolf was mostly an excuse to highlight different eerie phenomena each story; you could pretty much remove the Werewolf from the story without losing anything except the big fight at the end. Which, incidentally, I only saw recently; part of the reason the Marcosa House storyline has stuck with me for such a long time is that I didn’t know how it ended, and the ending is the only thing that turns it into a superhero comic. Penciler Don Perlin seems moderately influenced by Ditko in these issues, which adds to the eeriness. As a Hill House descendant combined with superhero aesthetics, this could be used almost verbatim as a dungeon adventure. Its been a long time since I last saw this movie; about all I remembered about it was the shiny things and that there was something other-dimensional about it. The latter meant it might be a good source for the adventure. Phantasm is possibly the first reality-bender I watched. The ending is very reminiscent of the later Nightmare on Elm Street ending. Unlike Elm Street (which doesn’t quite count as a horror house, though it shares many similar features), Phantasm is centered around a mysterious funeral home run by the very odd Angus Scrimm. I enjoyed this low-budget movie more now than I remember enjoying it in college. The movie version of the Overlook Hotel was shiftier than the book, but both are great haunted houses. King solved the problem of keeping his victims from leaving by putting them in the middle of nowhere covered in snow. This meant that the house itself didn’t have to shift. It was a hotel, with the potential for any number of haunted rooms each with their own ghost. I’ve slept in rooms like this. It’s the wallpaper that does it. It’ll turn any room evil. I saw the movie before I read the short story in Everything’s Eventual. This was a real tour-de-force for John Cusack. The front rooms of Crane House are inspired as much by Suite 1408’s idiosyncrasies as by Marcosa House. There’s very little gore for a modern horror movie. I think the most blood comes from a minor hand injury before the supernatural even starts in earnest. 1408 builds to its horror; it is very much a mind game. It’s also well-acted and well-written. There’s never a point where Mike Enslin (Cusack) does something ridiculously stupid just to keep the plot moving. Once it’s obvious he should leave, he tries to, but by then it’s too late. This movie was a lot of fun, and I really enjoyed it. Poltergeist is probably the weakest of the lot, but it’s still an interesting movie. The academic researchers in Poltergeist know real psychics, and can call on them when things get dangerous. This is a bit of a twist on The Haunting—it switches from the psychic investigators to the family living in the house. The nonchalant introduction of psychic researchers doesn’t quite work for me. When they’re up front, as in other Hill House imitators, I can accept them as the unbelievable thing that begins the action. When they come in halfway through, it’s too late. It’s like if, halfway through a standard cop drama, you suddenly had a superhero group show without warning to save the day. Looks like she’s running for president. Do you dare vote against her? 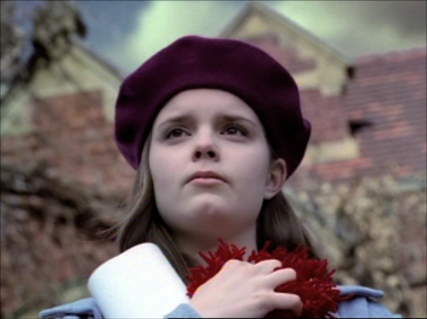 Rose Red is practically a superhero movie, putting its genre at odds with the driving force behind the main character. Professor Joyce Reardon wants to prove that the paranormal exists. In order to do this, she assembles a team of known paranormals, one of whom can reliably and repeatedly lift boulders, freeze water, and shake buildings, and brings them into a dangerous, insane house. She pays four people $5,000 each, and the one powerful telekinetic $12,000. Why not just test what Ann can do? Rather than measurements that could be faked and must be performed in an old house, Reardon could have done a double-blind study with Ann on one end and her unbelieving nemesis on the other. If Ann is willing to enter Rose Red for $12,000, I’d think that $32,000 should buy quite a bit of telekinetic activity. That out of the way, this is a very fun movie, with some serious acting chops thrown in. It is always a pleasant surprise to see Melanie Lynskey in a movie when I don’t expect it; this movie also sports an amazing performance by Matt Ross as an insecure post-cognitive who is annoyed at seeing dead people all the time. This is a 4-hour miniseries, but it’s worth it, so set aside some time to watch it. This Hill House descendant is a dungeon. The only thing it’s missing is the monsters. Clearly the forerunner of both Rose Red and Hell House, The Haunting is a beautiful movie. It was directed by Robert Wise, probably better known for West Side Story, The Day the Earth Stood Still, and The Sound of Music. Rose Red is pretty much an updating of Hill House with greater power levels. Hell House is an update with “modern” technology. From the poltergeist child to the academic assembling a team of psychics to the house you get lost in, The Haunting laid the groundwork for its descendants. It is also, despite a few 1960s over-the-top performances, well-acted and well-scripted. The book is amazing. Despite the many attempts at copying the book, no one has copied its heart: a young woman, lost, lonely, and scared of life, constructing a magical life for herself as she takes on a new adventure. And if you can find a copy of We Have Always Lived in the Castle, buy it. Strange, beautiful, and eerie, without any hauntings whatsoever. Clearly inspired by Haunting, this is a fascinatingly weird story that is almost as much science fiction as it is horror. In The Haunting we know the scientist has a theory but we don’t hear much about it. In Hell House, his theory is explained and comes with a giant be-metered metal box. It comes with a bit of a let-down at the end; some psychological underpinnings that just aren’t strong enough to hold up the legend of the house. But it’s definitely a fun seventies movie. Videodrome isn’t a house, but it shares some ideas with these houses: reality is malleable; people can return from the dead; the “house” has an agenda of death. Once you’re “in the house” everything is alive. Television is the house in Videodrome. Like any good haunted house, it changes. And the house watches you as you explore it. You never know when it’s watching or who watches along with it. This is a beautiful film. The “house” in this case is a school for dancers in Germany. The supernatural builds very slowly; only at the very end do we learn the nature of the place. Secret rooms, a history of witches, and dying revelations lead the way. Suspiria could be a role-playing game on its own. It is well worth watching as a movie. Oh, yes, we’re going to have fun tonight! 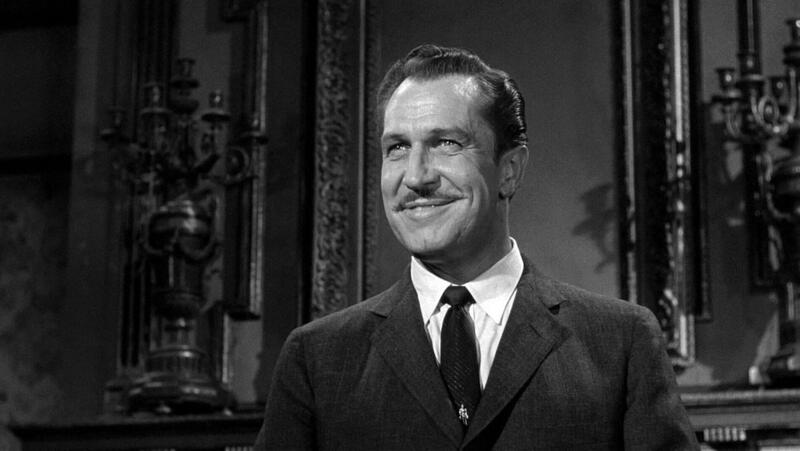 House on Haunted Hill, with Vincent Price, certainly looks like it was inspired by The Haunting of Hill House. No psychologists, but still, a group of talented and varied people invited to an old house along with the current owner who thinks it is a bad idea. The characters are accompanied by the owner, but, as in Hill House, are invited by a third party who is paying them to be there. In this case by Vincent Price’s millionaire, who promises them $10,000 each if they stay the night. As in Hill House, the doors are locked when the servants leave. And there’s the impressionable young woman lost in the maze of a house that seems to want to swallow her up. There are more similarities, but there are also important differences which would be spoilers. And of course the title consists of the same three basic words. Yet they appear to be completely unrelated. Shirley Jackson’s The Haunting of Hill House novel was published in 1959. The House on Haunted Hill movie was released on February 17, 1959. William Castle is known for the speed of his productions, but it seems very likely that the movie was written first. Unfortunately, I don’t know how to find full release dates, other than year, for novels, but to write the entire novel and have it go through the full publication process and still come out in 1959 makes it unlikely that Jackson was influenced by William Castle and Robb White’s script. The script does not appear to have been based on any previous work that Jackson could have been inspired by. It still, however, seems extremely unlikely to me that these stories are not related in some way. The stories and title have too many similarities. While they are in no way copies of each other, if one was not inspired by the other, there must have been some other inspiration to both of them. Provenance aside, House on Haunted Hill is very good. Vincent Price is in top form, and his conversations with his wife are in the old-school Hollywood tradition of sharp banter. It’s as much or more a mystery as it is a haunted house story, though I can’t say any more without spoiling some of it. It is definitely worth seeing. When there’s something bad… in your neighborhood… you probably don’t want to call this crew. Actually, this would have been a pretty good Ghostbusters cast. 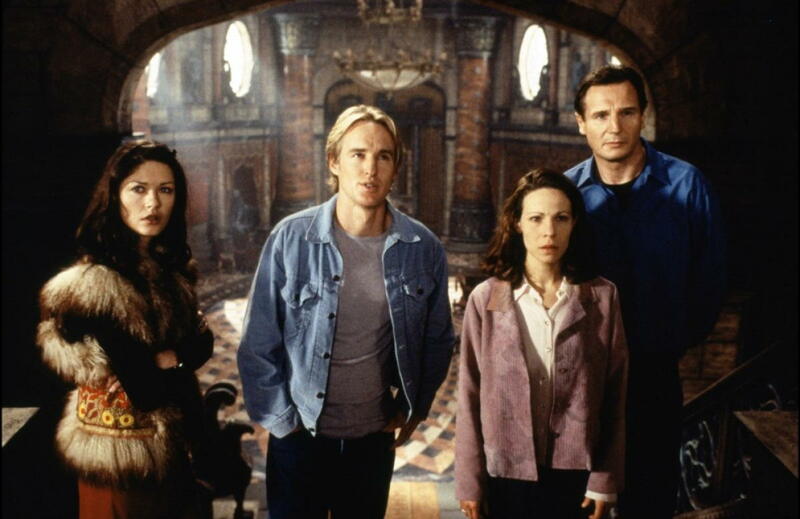 The Haunting, with Liam Neeson, Catherine Zeta-Jones, Owen Wilson, and Lili Taylor, is a pretty good retelling of The Haunting of Hill House, with permission. It’s a decent, though heavily flawed, psychological thriller until the over-the-top CGI at the end. The high point of the film is the decent—and I mean that sincerely—acting by all involved. The film’s greatest lack is that Liam Neeson is woefully underused. His character, despite being the lynchpin of the plot, doesn’t actually do much. It looks as though there was supposed to be tension about whether he was causing all or some of the hauntings but if so it was negated by perspectiveless scenes in which we see that the haunting is real. This also removes the other tension, which was the possibility that Eleanor is going crazy and hallucinating everything. If it’s happening when she isn’t present, then she’s not. A lot of the tension was squandered by keeping things from the viewer that the characters knew (or thought they knew). We have no idea, for example, that Liam Neeson’s character might have invited Eleanor specifically until we find out that he didn’t. We are never told why he has chosen the house or how he gained access to it. In the book, one of the heirs to the house accompanies them; his character is dropped from this version, but there’s a sort of completely wasted twist that plays on it. For the new movie, they exchanged the old paranormal research subplot for fear research, but that makes these people nothing special. In the book, the psychic potential of the subjects awakens the house; in this version the house, presumably, is always awake. Except that it isn’t: as in any good horror movie, the house wakes up slowly, perhaps fed by blood. Or perhaps not, because by the end of the movie it seems that the house has been awake all along, and able to affect happenings far, far away. Looks like he also inspired the Crypt-Keeper. An elderly researcher sends a telegram to a potential psychic to investigate an evil house, now empty and unsaleable. I had thought that the basic plot line began with Shirley Jackson’s The Haunting of Hill House, but the similarities to Algernon Blackwood’s 1906 The Empty House were obvious from the first paragraph, when he starts describing how some houses, like people, can be evil. Certain houses, like certain persons, manage somehow to proclaim at once their character for evil. The Empty House is a short story, very short, really just a haunted house described by the two witnesses. Whether or not either of the witnesses are psychic doesn’t figure in beyond as a speculation as to why the effects of the house are so physical around them. Nor is the idea of psychic research expanded upon beyond being the impetus for the aunt wanting to enter the house with her nephew. But if you’re interested in the development of the Jacksonian haunted house, you’ll want to read Blackwood’s story. I found it in Best Ghost Stories of Algernon Blackwood, which I recommend if you enjoy older horror, such as Lovecraft’s. Blackwood was an influence on Lovecraft as well as presumably on Jackson. Also among these stories are his John Silence character, a psychic detective who, with a bit of tweaking, could be a model for a haunted adventurer. The stories are presented chronologically as written, according to the introduction2, and so the writing style improves as you move through the collection. If you aren’t interested in old stories for their own sake, you might start with The Wendigo or especially The Other Wing, which is where they really begin to turn eerie. I almost gave up on finding Hell House as a book. I wanted to get it in mass-market paperback size so that I could carry it with me; the Legend of Hell House movie didn’t make me think it was going to be up to the level of something I’d make time to read at home. Finally, my girlfriend tracked down a copy this year and gave it to me for my birthday! I’m not going to say much about the book specifically; it’s one you’ll want to read to get the surprises from. There are definitely surprises if you’ve seen the movie: it’s very different, especially toward the end. The “be-metered metal box” makes a bit more sense in the book, and in fact how it works plays a major part in the ending. This is still a variation on Shirley Jackson’s The Haunting of Hill House. It’s the same basic story: parapsychology researcher enters a notoriously-haunted house with a team of psychics. In this case, however, the psychics were not chosen by him, and he would have preferred to bring in psychics he’s more familiar with. But a rich, dying man has chosen his team—and him—and is calling the shots. He wants proof of life after death, because he’s going to die. None of the team particularly respect each other’s talents; they each tend to disbelieve the other. But, while Matheson tells the story from everyone’s perspective, shifting from the scientist to the psychics to the scientist’s wife and back, the scientist’s perspective is privileged. The chapter headings are dates and times, as they might be entered in a journal. When they hold a séance, Barrett, the scientist, measures the medium’s pulse, her respiration, the temperature of the room, and four electrical contacts between the medium’s body parts and the table, to know if she’s trying sleight-of-hand. He has a pressurometer and a dynanometer and “a dark blue instrument” that measures electromagnetic radiation. Each of the devices automatically records its readings, but he also manually dictates their values regularly into a tape recorder. I would not call this “one of the great novels of the occult” as the cover proclaims; but it is definitely a mirror of its times, when parapsychology was beginning to be taken seriously for a short period of time. Barrett could just as well have been my faculty advisor at Cornell, a physicist who went into psychology and then searched for ways to create measurable, replicable parapsychology experiments. Collecting Werewolf by Night #21-43 and a few others, this contains the Belaric Marcosa storyline from issues 34-37. One of Stephen King’s more famous haunted house stories, a very creepy descent into madness. This collection of short stories includes the Gunslinger story “The Little Sisters of Eluria”, as well as the award-winning “The Man in the Black Suit”. And, of course, 1408. Hill House has become the prototypical haunted house, and yet the original is still the most beautiful. A mysterious tale, with obvious truths hiding poorly behind every page, much as Constance does; beautifully written with lovingly neurotic characters, it’s a great book. The original novel, Hell House, is better as both a haunted house story and a psychological horror story than the movie was; the bland science of the movie, while it doesn’t make much more sense, is less bland and plays a bigger part in the book. John Cusack did a great job holding this one-room script together; note that there’s a two-disc version of this movie with a director’s cut, but the theatrical version was so well cut that I can’t imagine an extended version doing anything but lessening the movie. The movie plays up Eleanor Vance’s mother’s death, and plays down her etherealness, but this is a great translation of an untranslatable book to movie. This high-powered take on The Haunting of Hill House was a lot of fun to watch, and sported a surprisingly good cast. Anchor Bay does a decent enough job pulling together a few extras, such as interviews with the Tall Man and Jody, a nice commentary track, and footage from a convention panel. Back in the old days few people could do a Stephen King novel justice—including Stephen King. Stanley Kubrick did a great job with The Shining, and Jack Nicholson provided some iconic scenes (as did Danny Lloyd). A fun movie from the eighties, it’s an oddly light take on the “Hill House” style of haunted house movie. A weird sci-fi-horror, fun, but not up to the quality of its ancestor. Think that television controls minds? In Videodrome, it controls bodies, too. Suspiria is a very simply-told story, but it’s beautifully shot, in a ballet school in Germany. “The stories of Rose Red, its builders John and Ellen Rimbauer, and the gruesome fates of its unhappy tenants were all news to us. Why had we never heard about this sinister fin-de-siecle mansion at 7th Avenue and Spring Street?” Yes, especially with a name like Crowley? Another early haunted house on a hill ensemble, this one came out before Shirley Jackson’s book, and yet is, dare I say it, eerily similar. “The Haunting” is an official remake of The Haunting of Hill House. In many ways disappointing, the acting makes up, partially, for the deficiencies in direction and plot. 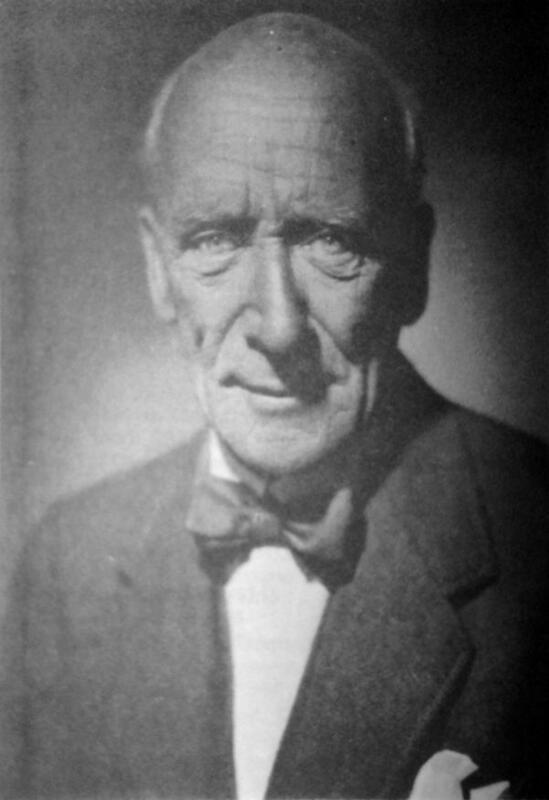 Algernon Blackwood’s The Empty House is almost certainly a precursor and inspiration to Shirley Jackson’s The Haunting of Hill House. Movies need a new technical advisor in the credits: the role-playing technical advisor. Otherwise known as the “pick up the damn gun” advisor. Horror Houses last modified August 13th, 2016.